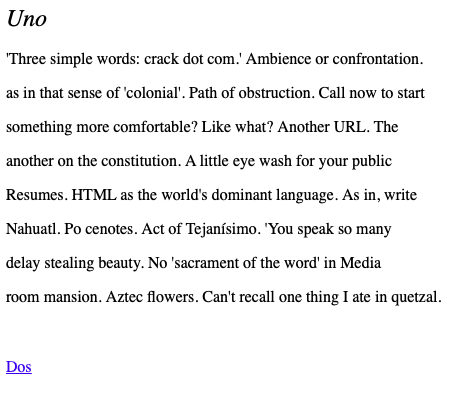 White-Faced Bromeliads on 20 Hectares is a digital poem, which includes a mixture of primarily the English language with some instances of Spanish. In this work Glazier explores alternatives to our customary experiences, through the use of a generator which changes the text of the poems every 10 seconds, turning it from it’s traditional static state to one with movement and change. Furthermore, the evocation of traveling through the images and anecdotes, provides an exploration of a multilingual and multicultural experience. Additionally, the presences of the HTML code leads to a work with multiple possibilities, primarily on how the reader perceives and experiences the work due to the possible technical reading of the code and the multiple possible poetic readings. 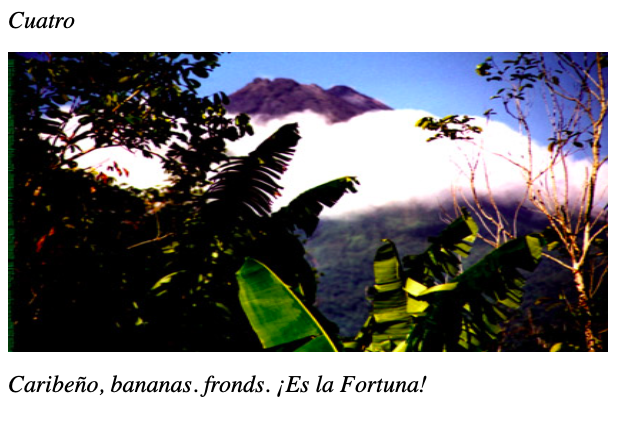 Blending Spanish and English and offering a sort of postcard prelude to each of its constantly changing stanzas, White-Faced Bromeliads on 20 Hectares is a poem that explores alternatives and crossings. From line to line the reader can enjoy the turns of phrase but then must figure out how to deal with their constantly turning nature. Options include waiting for the line that was being read to re-appear, re-starting from the beginning of the line that just appeared, or continuing from the middle of the word or phrase. White-Faced Bromeliads on 20 Hectares es un poema digital, originalmente escrito en inglés y español. Después la obra fue traducida completamente al español. La obra de Glazier explora los varios alternativos a nuestras experiencias habituales, a través el uso de un generador que muta el texto del poema cada 10 segundos, resultando en un poema dinámico y cambiante, en contraste a su forma tradicional, estático. Además, las imágenes y anécdotas dentro del poema evocan una esencia de viaje, proporcionando una experiencia de la multilingüe y multicultural. Por último, el uso del código HTML convierte la obra en una de múltiple posibilidades, no solo por su generador, pero por su capacidad de ser experimentada y percibida por el lector en distintas formas, como una lectura técnica (de código HTML) o poética. 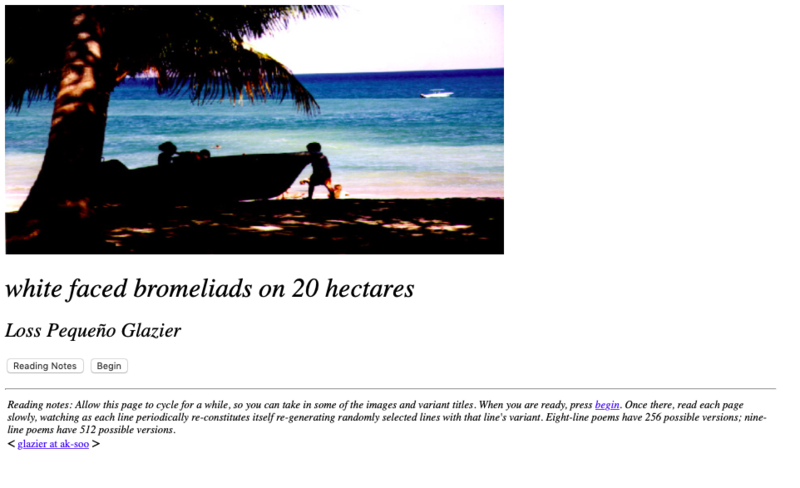 Author Reading notes: Allow [title] page to cycle for a while, so you can take in some of the images and variant titles. When you are ready, press begin. Once there, read each page slowly, watching as each line periodically re-constitutes itself re-generating randomly selected lines with that line's variant. Eight-line poems have 256 possible versions; nine-line poems have 512 possible versions. 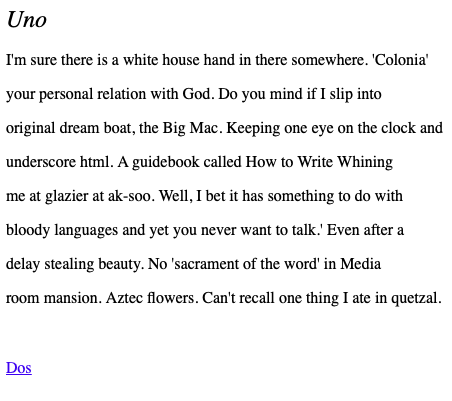 Sample of HTML for "Uno"